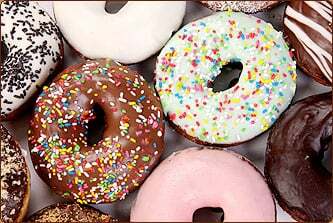 Confirmandi - thank you for signing up to help with Coffee and Donuts! We need one student and one parent to fill each time slot. (In other words, there will be two students and two parents at every shift.) Please come dressed in church attire, as part of your duties will be to greet and mingle with the guests. Detailed instructions will be provided at the time of your arrival, but in a nutshell you will be setting out, serving, and replenishing the refreshments, greeting your fellow Parishioners, and cleaning up after the last session. 7th and 8th graders are required to serve at least one shift of Coffee and Donuts each year. Please note that if you need to change the date of your Coffee and Donuts service after you’ve already committed to a time slot, it’s your responsibility to find another student/parent combination to take your place, so try to choose an initial date that you know will be convenient for you.